tRish bEe's aRtbUzz | get your muse buzzing! Due to constant ill health I have decided it is best to postpone all challenges on this blog and my other blogs until further notice. I had hoped rather optimistically that I would be able to overcome health issues and be able to be back in the thick of things running challenges and posting new techniques and ideas but my mind and body have other ideas! One day when my health is in a better state I may be able to return to doing all of that but for the time being I am postponing all challenges etc until further notice. I will continue to make artwork in my spare time and occasionally upload what Ive done to my flickr gallery and my main blog but that is all I can commit to at this present moment in time. Apologies to everyone in advance for any dissapointment caused with this decision. I wish I had half the energy I had 4 years ago but sadly I havent anymore. Both involving watercolour washes, which will you try? Why not both? Might be adding another one yet so watch this space! Apologies for not updating my blogs or websites. Ongoing health issues have prevented me from spending much time online. The weather is currently very cold in the North of England, so I am hibernating in my mouse hole for the winter. I’ll be coming out to play as soon as the sun starts shining again and the spring flowers start to bloom…..
1. If you dont have black gesso then first paint your pages with white gesso, allow them to dry then paint over the top with black acrylic paint. If you do have black gesso just paint ONE layer of black gesso and allow to dry. 2. You need to work quickly for this next step – On one page apply spots of metallic or pearl acrylic paints – use a variety of colours. 3. While the paint is still wet close the book and hold it tight with your hands. 4. Open up your pages to reveal an instance background of colour on your board book pages – let dry or use a heat gun if your impatience…..
Time to start another spread! 1. Apply a layer of gesso over entire 2 pages and allow to dry. Allow the glue to dry, prefably overnight. 3. Apply another layer of gesso all over the top of the book pages and also the glue mess. Let dry. 4. Take some bright red acrylic paint – the brightest red you own! And paint it all over the surface of the board book page and the glue – be generous with your paint and make sure you get in all the nooks and crannys. Let it dry overnight. 5. Now you need some gold acrylic paint or any metallic acrylic paint such as silver or bronze. I prefer gold 🙂 Pour a little blob of gold acrylic paint into a container – I used a margerine tub lid for this. 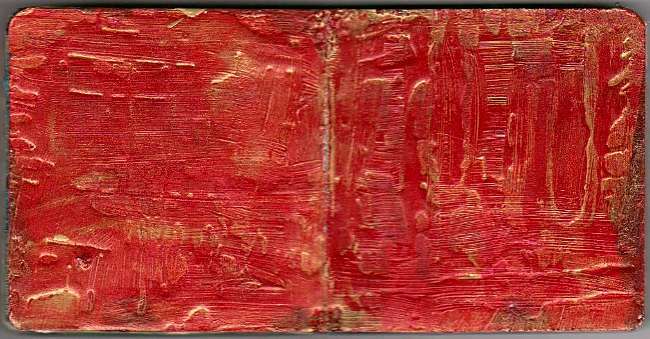 Dip your pointy finger into the paint and using your finger very lightly rub the gold paint across the surface of the book. 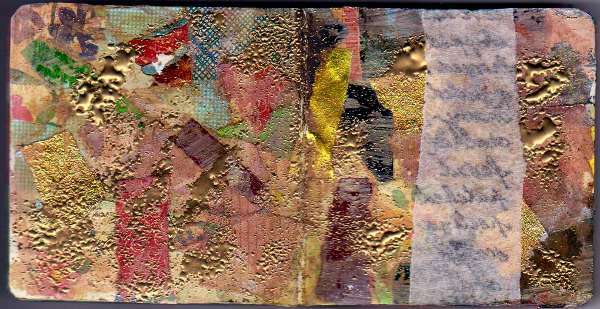 You are aiming to create gold highlights, pay particular attention to the raised glue ridges and let more of the gold paint fall upon those textures and ridges. Do not completely cover the page in gold – less is more. You want to see mainly red on the page. Let dry. Ive decided that we are going to go down the Asian route with this page as the striking red and gold reminds me of Asian colours. 1. Using either black acrylic paint or black gesso or a bold black inkpad such as brilliance I want you to find an Asian style background stamp to accent your pages with- if you use Brilliance ink you will need to heat set the ink or use embossing powder to make it permanent. Dont go overboard with the stamping as you want the red background to be more prominent. 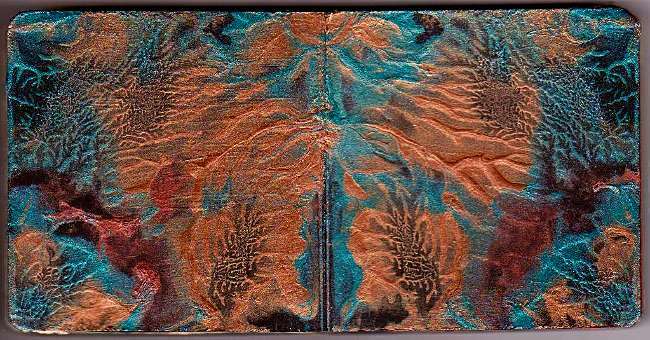 Think of stamped accents such as Asian lettering, mesh, fern leaves, lotus flowers, screens – anything with a texture and stamp along the edges of the pages to add accents. 2. Next make yourself a sheet of Faux Washi Paper – you need tissue paper and inks for this, if you dont have inks you can use reinkers or thinned down watercolour paints. 3. Next you need to make a large Asian themed embellishment for your page, the embellishment wants to be medium to large in size as it will be the focal point on one of your page flaps. You can use one of the following options to make your embellishment: funfoam, utee, clay or shrink plastic. IMPORTANT – DO NOT USE AN ASIAN STAMP TO MAKE YOUR EMBELLISHMENT! The challenge is to make your embellishment look as Asian as you can WITHOUT using an Asian stamp! Once youve done that scan your stamp board book spread, your washi paper sample and your Asian embellishment and upload it…we’ll be sticking them down in Step 3…. Im so sorry for not being more active and for not posting the next steps for the board books and leaving you all hanging on like this….I have no excuse apart from my usual excuse – except its not an excuse anymore its a bloody pain in the bum! Well not literally! The cold and damp weather has always played havoc with my hands and puts me out of action but these days its not just my hands its my legs and joints too! Argh! I take pain killers for the pain but they make me feel funny and I cant concentrate which is why Ive been so quiet. 1. Take your faux washi paper and tear it into a strip – you can have a large wide strip or a thin strip – its up to you. Stick it down on either the left or the right hand side of your page spread. 2. Next research on the internet for a Haiku which catches your eye – a Haiku is a short Asian poem. 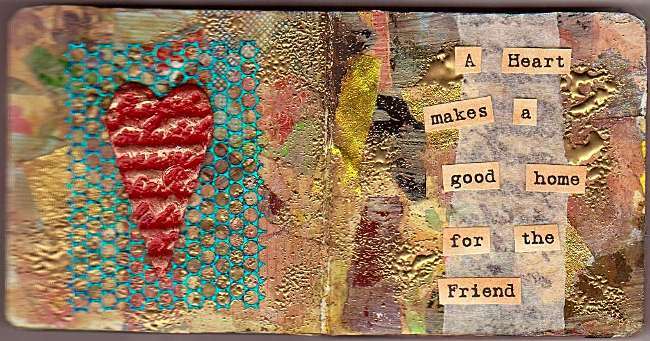 Print your chosen Haiku and cut and layer it on either the left or the right page – either over the top of the faux washi paper or on the red golden painted background. 3. Take your handmade asian embellishment and glue it onto the opposite page where you have stuck your Haiku down. Ok now are you ready to begin page 3 in your board book? 1. Gesso the next two pages in your board book, allow the gesso to air dry properly overnight. 2. For this next step you need lots of different paper scraps – you can use anything for this – magazine papers, book papers, scrapbook papers, gift wrap, colour paper, metallic. 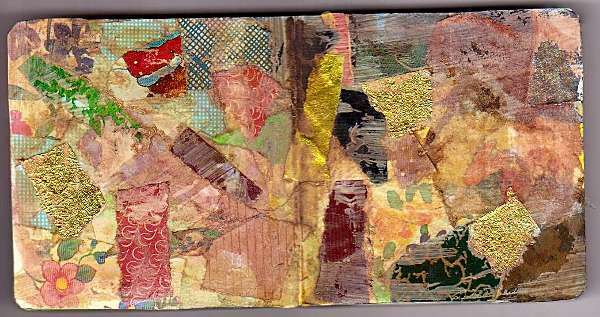 Tear the scrap pieces into small pieces and glue them down all over the 2 pages using pva or any clear drying glue. Make sure all the papers overlap and that there is no trace left of the actual original book left. Let glue air dry, prefably overnight. 3. Use a damp sponge and lightly gesso over the entire page of scraps – you dont want to ‘white it out’ – just apply a light coat so that it is slightly ghosted. Let gesso air dry. 4. If the gesso coat is applied too thickly now is your chance to remove some – use either a baby wipe or a damp sponge or paper towel to gently rub and remove SOME (not all) of the gesso to give it a slightly distressed look. Let dry. 5. Using the SAME stain you used in step 3 of page 2 (when you stained the green and orange pages using a light brown ink) rub the colour all over the pages to get a nice brown ages stain on the page. 1. Get some gold embossing powder and sprinkle it over both pages, imagine you are adding flavour to food and sprinkle it on a bit at a time – SPARINGLY, you dont want too much – do not stress about how the gold embossing powder looks on the page! 2. Use your heat gun to melt the gold embossing powder – take care not to blow away the powder with the heat, I find it best to start using the heat gun at a distance to gently warm the powder then as it starts to heat up I move the gun in closer and closer – this prevents the heat blasting the powder away. 3. Take a strip of wide masking tape – you want masking tape which will actually stick so do not use low tack masking tape! A nice strong sticky type will do. Tear the edges of the masking tape so that it doesnt have straight edges anymore. 4. Take a long script or pattern rubber stamp and ink it up with black ink, I used a script border stamp by Home Impressions for this. Leave the inked stamp faced upwards on your table do not stamp with it yet! 5. Take the strip of torn masking tape and place it gently on top of the inked stamp and then use your finger to gently rub the design onto the tape, then lift the masking tape off the stamp. 6. Place the stamped masking tape sticky side down onto either the left or the right hand book page to create a muted stamped masking tape border. 1. Make a heart shaped embellishment, this embellishment needs to be biggish because it is going to be a focal point on one of your pages – do not cheat and use one which is already made! Heart Option A: Cut a heart shape out of a sheet of craft foam or fun foam, heat the fun foam up with your heat gun and stamp directly into the foam using the same the same script or pattern stamp you used on the masking tape. Hold the stamp there for a few seconds to create a lovely raised impression. Heart Option B: Cut a heart shape out of a sheet of shrink plastic – remember this will need to be BIG because it will shrink! Heat the shrink plastic to shrink it and then while it is still warm stamp the same script or pattern stamp you used on the masking tape and hold it there for a few seconds to create a lovely intalligio impressed image. Heart Option C: Cut a heart shape out of a piece of air drying or polymer clay and then stamp directly into the clay using the same script or pattern stamp you used on the masking tape and then let air dry or cook for the time required. Heart Option D: Use utee to create a heart shape and then the same script or pattern stamp you used on the masking tape directly into the warm utee, hold it there for a few seconds to allow it to set. 2. Once youve got your stamped heart shape you now need to add colour to it! Base coat the heart with a lovely red acrylic paint and let it dry. 3. Take some gold acrylic paint and dip your finger into it and use your finger tip to gently buff over the top of the raised part of the script stamped heart to highlight it. Let paint dry. 4. Cut a layering square or rectangle of something transparent and see through to layer the heart onto on the page – you can use punchinella (sequin waste) or you can use magic mesh, any kind of mesh, net, muslin, lace, doilys, vellum – ANYTHING. The trick is to pick something which will not totally obscure the background underneath it so it is still slightly visible. 5. Stick down your chosen square onto the book page without the masking tape strip on it and then glue the heart over the top of this. 6. Pick out a heart quote that takes your fancy, print it out and layer it over the side with the masking tape border to finish. Now you’ve completed your first pages its time to move onto the next 2. I haven’t completed mine yet because I don’t work that way – I leave my pages a while before I finish them off properly! You may want to place a sheet of non stick parchment or something similar between the pages you have already created to protect them while your working on the next 2 pages. 1. Gesso the next 2 pages of your book, if you haven’t already done so. 2. Use a pencil and ruler and mark a feint horizontal line across the book going right across the 2 pages – you want the line to be just below the halfway mark (middle) of the book – in other words there should be more surface area above the pencil line than below it. 3. Using the pencil line as a guide & using the same pencil; draw a wavy line across the 2 pages along the line – you can make the wavy line super wavy or a gentle incline or go all out crazy wavy – its up to YOU. Just make sure there is a nice wavy line going across the pages. Do NOT worry about being neat and tidy. 4. Paint the area above the wavy line with bright ORANGE paint – acrylic or similar – paint right up to the wavy line – don’t worry if you go over the lines as you can neaten it up afterwards. Let paint dry. 5. Paint the area below the wavy line with lime green acrylic paint or similar – as before paint right up to the wavy line. Let it dry. 1. Paint a thin red stripe along the wavy border across your page – paint it on the side where there is more orange background colour. Dont worry about neatness. 2. Using the same red paint add colour to 2 pages torn out of a paperback book – if you dont have a paperback book you can tear text pages out of a magazine instead and add colour to them. Set these aside once dry for future use. 3. Take 3 sheets of paper from a paperback book – or you can use 3 pages of text torn from a magazine, using a damp sponge lightly gesso over these 3 pages – do not completely white out the text – you want the text to still be visible through the gesso. Let dry. 4. 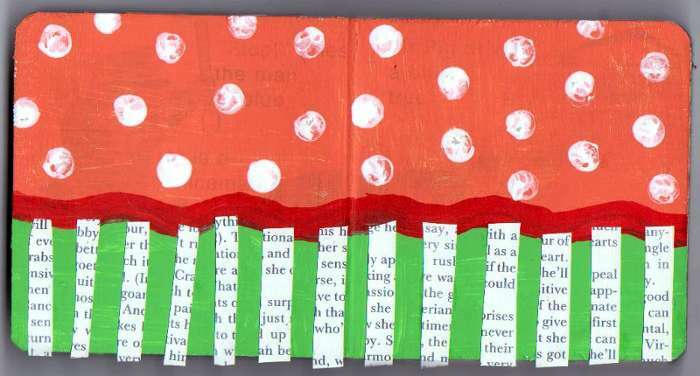 Take 1 sheet of the gesso book paper and cut it into narrow strips, use pva glue to glue strips of paper to the green part of your book pages as if creating candy stripes – leave a gap roughly the same size of the paper strip so that you create stripes across the pages of green and book paper. Trim off any excess, dont worry about making the strips fit perfectly over the top of the red border. 5. Using the other sheet of gesso-ed book paper, use a circle punch or cut freehand to cut out lots of little circle shapes. Set these aside for later use. 6. Take a pencil with a small rubber/eraser on one end and use this as a stamp – dip it into gesso and apply white dots to the orange background, dont worry about being exact – just stamp the dots till your happy with the results and set aside to dry. 1. For this next step I want you to add some kind of light brown wash to stain the entire page, this is to age it slightly and make it look weatherworn and not so vibrant. You can use something like watered down walnut inks, watered down watercolour paints, re-inkers, colourwash sprays or whatever you have to hand. I used the adirondacks butterscotch colour wash spray for this step as I didnt want anything too dark as I still wanted the background colours on the page to be visible through the stain. If it helps – think of a light aged lace or tea stain – this is the type of instensity of the stain you want for your book. 2. Now to put your drawing skills to use! ….but I cant draw! I hear you cry! Worry not – its easy if you follow these steps. 1. Start off with a small circle. 2. Draw 2 loops coming off your circle at the top and bottom – dont worry if they dont look perfect. 3. Draw 2 more loops coming off the circle at the right and left. 4 & 5. Use the spaces between the loops as a guide to enable you to draw more loops around the circle to complete your basic flower shape. 3. After a few practise runs you should have a collection of flower petal shapes; go through them and pick out your favourite ones & roughly cut them off the sheet in a square – do not cut around the petals. Just cut a square around your flower to remove it from the sheet leaving a generous border. 4. Pick out 3 sheets of scrapbook paper in light natural colours – I used sheets in: tan orange, pale yellow and a pale green. You can use any papers for this so long as there are different colours – handmade if you prefer. 5. Stack the 3 sheets of paper neatly together and then place one of your hand drawn roughly cut out flower shapes over the top of the paper stack. 6. Use scissors to cut around the petals of the flower shapes youve drawn – you are cutting through the actual drawing you did and also through the 3 sheets of scrapbook paper at the exact same time, thus creating 3 flowers with the 3 different coloured sheets of scrapbook paper. 8. Gather up the flowers and arrange them into sets of 3 of the same sized petals, punch a tiny hole in the centre of each petal and then pierce a coloured brad through the centre to piece together the 3 different coloured flower shapes (of the same size). 11. What do flowers make you think of? Do you have a favourite flower quote? If not go search for one from one of the various poetry and quotations websites out there. Once youve found one, copy & paste it into a word processor & print it out. 12. Cut the quote out along the words and arrange it across your pages and stick it down. 13. Look at your page now and ask yourself – is it finished? Does it need something else to finish it off? Anything at all – add that final touch what YOU think your pages need. a new challenge blog for wannabe artists and stamp addicts to get your muse buzzing! If you want to take part in any of the challenge themes simply post a comment and leave the full blog url of your artwork in the comment form. Please remember to post a link back to this blog in your blog entry. tell all your aRt bUzzies about us! tRish bEe’s aRtbUzz · get your muse buzzing!